If you want to buy an autographed and stamped copy of CONFRONTIER by Kai Wiedenhöfer – A book about eight borderwalls worldwide. 184 pages with 8 gatefolds 85,8 x 32,5cm, paperbound hardcover with foil embossing. Limited numbered edition of 40boxed books with a 22x30cm archival fibre print from the fall of the Berlin Wall 1989 for 300 Euros. Payment by bank transfer in the EU, world by paypal. 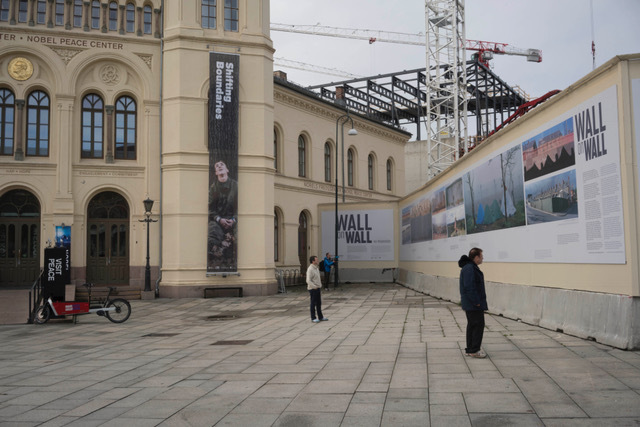 WALLONWALL was a photo exhibition on the Berlin Wall about walls that separate people worldwide. The open air exhibition : 10, July till 10, November 2013. Admission was free for everybody 24 hours a day, 7 days a week. 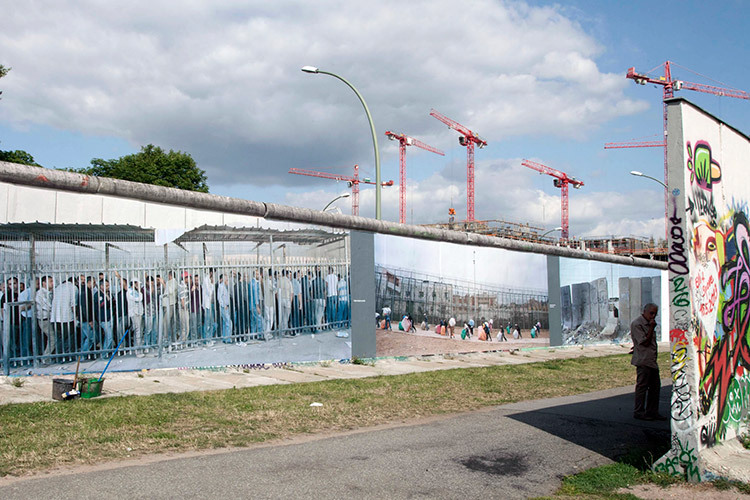 The concept of the exhibition is simple: on the longest remaining part of the Berlin Wall at Mühlenstraße we will glue 364 m of the wall with 36 huge panoramics. Its on the side of wall which points towards the river Spree. The other side of the wall is known as East Side Gallery and one of the touristic hotspots of Berlin. A World between Walls from Martin Mostert on Vimeo. Each picture measures 3 m x 9 m. The height is determined through the distance between the base of the wall and the lower part of the tube on top of the wall. All photographs are executed with large format cameras which makes the big enlargements possible. The pictures 1080 sqm and are printed with an inkjet printer on blueback paper and than mounted on the wall with normal wallpaper glue. The panorama photographs are only interrupted by a grey sheet with a caption in English and German.